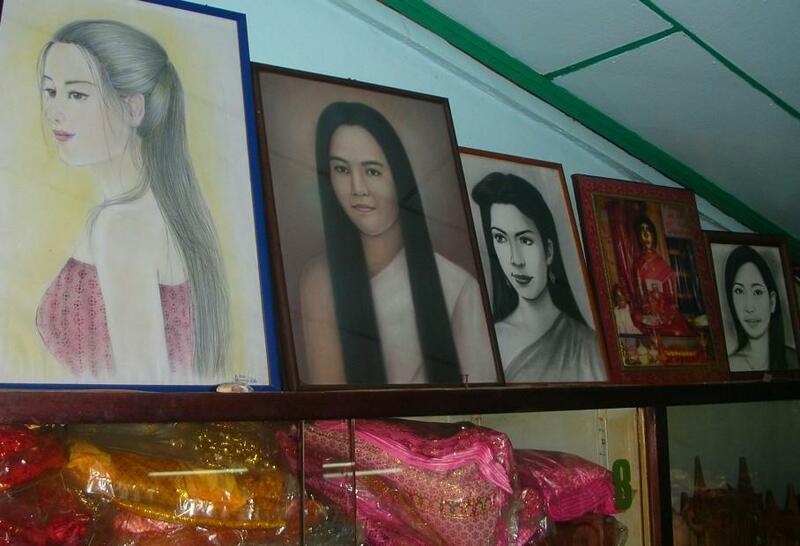 Belief in ghosts in Thai culture is both popular and enduring. In the history of Thailand Buddhist popular beliefs intermingled with the legends about the spirits or ghosts of the local folklore. These myths have survived and evolved, having been adapted to the modern media, such as Thai movies, Thai television soap operas and Thai comics. Some of the ghosts of Thai culture are shared with neighboring cultures. Krasue, for example is part of the Cambodian, Lao and Malay culture as well. A few of these, including the tall Pret, are part of the mythology of Buddhism. They are others though, such as Phi Dip Chin, which have entered the Thai ghost lore through the Chinese community residing in Thailand for the past few centuries. Thai spirits or ghosts are known generically as Phi (ผี). A large proportion of these spirits are nocturnal. Except for the well-known Pret, most ghosts were traditionally not represented in paintings or drawings, hence they are purely based on stories of the oral tradition. The local beliefs regarding the village spirits of Thailand were studied by Phraya Anuman Rajadhon. Ghosts are believed to be found, among other places, in certain trees, burial grounds near Buddhist temples, as well as some houses, especially abandoned houses. There are different categories of ghosts. Certain ghosts dwelling in mountains and forests are generally known as Phi Khao (ผีเขา) and Phi Pa (ผีป่า). Geographic locations such as the Phi Pan Nam Range (ทิวเขาผีปันน้ำ), "the mountain range that the spirits use to divide the waters", and Phae Mueang Phi (แพะเมืองผี) are named after the ancient ghosts believed to dwell in the places. 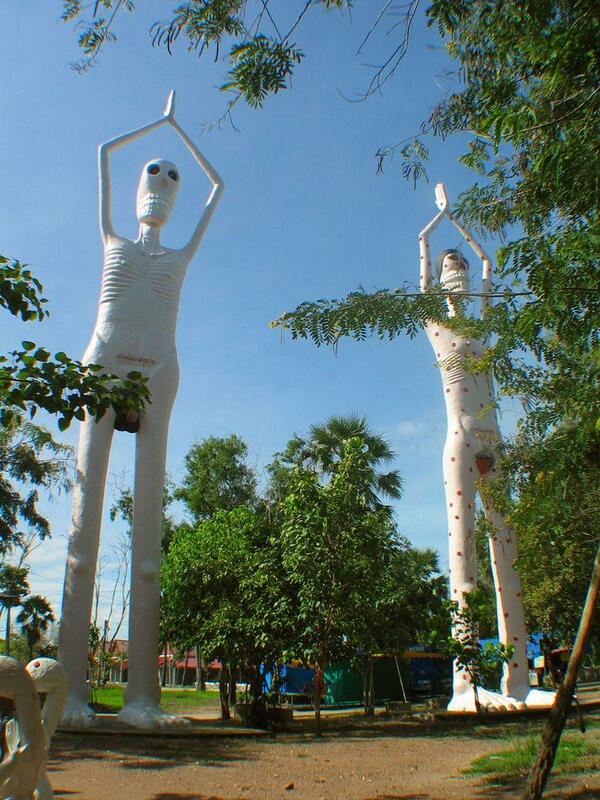 Female ghosts or fairies related to trees such as Nang Ta-khian and Nang Tani are known generically as Nang Mai (นางไม้ "Lady of the Tree"). Ghosts in Thai culture may be benevolent. Certain ghosts have their own shrines and among these there are some, such as the Mae Nak Phra Khanong shrine in Bangkok, that are quite important. Usually though, humbler tutelary spirits live in little dwellings known as San Phra Phum (Thai: ศาลพระภูมิ), small ghost shrines that provide a home for these household or tree spirits. These shrines are common near trees and groves and in urban areas, close to buildings. It is considered a bad omen to neglect these spots and offerings are regularly made by people living nearby. Usually offerings to tree spirits are small things such as small food items, drinks, incense sticks or fruits, but when important favors are requested it is common to offer the head of a pig. After the ceremony is over the pig head is brought home and eaten. The Mo Phi or witch doctor (หมอผี) may invoke spirits of the dead. In this ritual usually four sticks are planted at equal distance from each other on the ground near the burial or cremation place. A thread is tied around the sticks forming a protective square and a mat is spread in the middle. The Mo Phi sits down within this enclosure, often along with other people present at the ritual. In front of him, outside of the square there is a Mo Khao terracotta jar containing ashes or bones of the dead person with a yantra painted on the outside. Beside the jar there is also a plate of rice as offering and a stick or switch to keep the spirits at bay. On the other hand there are spirits that are considered dangerous and need to be disposed of. In these cases the Mo Phi may conduct a ritual in order to confine the dangerous ghost to an earthen jar, which may be sealed and thrown into a deep canal, river of lake.